Last few years there is a concerted attempt on the part of the ruling BJP to ignore and undermine the legacy of Jawaharlal Nehru, the first Prime Minster of India, the architect of Modern India. In the international meets his name is deliberately ignored. He does not find a mention in the National archives Museum on ‘Quit India’ movement. In many school books chapters on him are being deleted. The Government spokespersons are trying to attribute all their failures of present government to Nehruvian policies. At social media level dirty propaganda about his being a man living in luxury, his ancestors are making rounds. The misinterpretation of events of history is being used to the hilt to blame him for partition and Kashmir issue. Mr. Modi went on to say that Nehru did not attend the funeral of Sardar Patel! Let’s have a brief recap of the man immortalized in his work of laying the foundations of modern India in the fields of industries, technology, agriculture, education and science. He was exposed to the global issues and became a committed to anti imperialist struggles, stood against racism and believed in equality of all nations. Coming to India; he came under the magic spell of Gandhi and went headlong in to participate in freedom movement. The major highpoints of his contribution is to give the call of total independence as President of Congress. He adapted simple Khadi (handspun cloth) in his life style. As a participant of the freedom struggle he was jailed time and over again, the total period of his being in jail was 3259 days! He was a prolific reader and writer. His books ‘Autobiography’, ‘Discovery of India’ and ‘Letters of a father…’have become a permanent part of Indian-world literature. The question of partition was a very intricate one with British determined to divide the country, this became easy for them due to the fall out of Savarkar’s ‘Two Nation theory’ and Jinnah’s adamant demand for ‘separate Islamic country’, Pakistan. It was Sardar Patel who first realized that partition is inevitable, while Nehru was to come to this realization months later. In matters of Kashmir, as Patel pointed out in his speech in Junagadh, he was willing to let Kashmir go if Hyderabad was merged in India. It was Sheikh Abdullah’s insistence that Nehru came forward to have the ‘treaty of accession’ and sent the army to quell the aggression from Pakistan. As far as Prime minster ship is concerned Gandhi had the mandate of the nation and he did realize that Nehru has a better grasp of World affairs and will be a worthy successor to him in matters political. 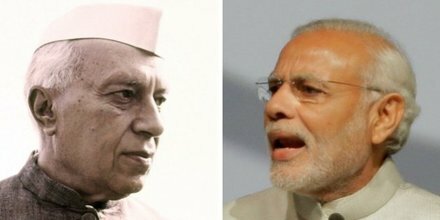 Nehru was a mass leader, as Sardar Patel in response to a journalists quip; that there are lot of people who have turned up for meeting; said that the people have come to see Jawahar not him. His public sector policies are being criticized today. It was not just his pipe dream to have this sector. The industrialists, as per Bombay plan (1944) were asking for state assistance in setting up industries, and needed protection. It was these public sector heavy industries which provided the base on which other industries could come up and thrive. Paul Kruggman, the Nobel Laureate, points out that India achieved in last 30 years, is close to what Britain achieved in last 150 years. This is only because of the solid foundations by the initial years of the republic. His policies in education and science are the base due to which today we are able to compete in the world and India is coming up as a major economy. Parallel to the policies in industrialization was the focus on science and education. Today if we compare the state of science and technology with the countries which also became independent when we became independent, we are far ahead. While Nehru-Ambedkar due ensured that scientific temper is the part of Directive principles of our Constitution, Nehru also went on to actualize it by laying the foundations of institutions like IITs, ISRO, BARC, CSIR etc. Health care in state sector saw the emergence the enviable AIIMs. We began with a literacy rate of 14% and the health was reflected in the longevity of 39 years. We are miles ahead today, though still a long way to go! Nehru was firmly committed to pluralism at social level and secularism as a policy of the state. It is in this direction that in post partition riots he came out in the open jeep to himself quell the riots. In the wake of 1961 Jabalpur riots, he instituted National Integration Council (NIC). He could fully win the trust of religious minorities, a far cry from what is the state of affairs today. His institutions like Planning Commission and NIC have been put to sleep today. The income differentials are leaping to sky today with Corporate having a free hand. Was he faultless? No way. He had his own quota of failures as in the case of trusting China and the setback in India-China war. His policies of big dams have its own shortcomings. The question is overall he left a deep and positive mark on the destiny not only of India but also over the World. In its pettiness the present government wants to ignore, undermine and belittle his contributions. Two of his major initiatives Planning Commission and NIC have been done away with. Nehru is a particular target of sectarian ideology which is spreading all sorts of falsehoods on his name. This is abominable situation where in a systematic way his character, lineage and contributions are being targeted. The present ruling dispensation did not participate in freedom movement, does not have any icon worth its name, and so is trying to appropriate some icons like Sardar Patel. Ideologically they see Nehru as a big obstacle to their narrow goals so this ugly propaganda and narrow minded attitude towards Nehru.